Given the chance that the Fed will possibly hike rates within the next year -- assuming that nothing will cause them to push back "lift off" once again -- the question arises as to what effect this will have on the economy. In my view, a couple of rate hikes will do little to change the conditions in the domestic economy, given that the U.S. housing market is not exactly a major driver of growth. Instead, the effect would likely show up via financial markets, most notably the currency market. (Of course, risk markets may get hysteric about a Fed rate hike; I have no idea why any responsible adult would believe that a marginal rise in short-term funding would have any effect on the fair value of equities.) In this article, I give an overview of how I analyse the relationship between interest rates and the value of the currency; I hope to discuss some historical episodes in later articles. What Determines The Value Of Currencies? One can break down the possible theoretical frameworks for determining the price of anything as follows. Administered pricing. In the case of currencies, this would correspond to a currency peg framework. (In other markets, prices can either be administered by the government, such as is the case for short-term interest rates, or by corporate bureaucracies. Post-Keynesian inflation analysis highlights the importance of administered prices.) Although interesting and historically very relevant, I am not going to discuss currency pegs here. Note that a lot of "emerging markets" have tended to have currency pegs, and so a lot of "free floating" currencies (like that of Brazil) might need to be looked at as if they were still in a pegged regime. Supply and demand. We assume that there are supply and demand curves, and that observed pricing is what puts the two sides of the market in balance. This is a common approach to commodities; for example, analysts look at the marginal cost of production for oil, and then try to guesstimate how pricing affects demand. The problem with this theory is that since the two curves are not directly measurable, it is possible to "explain" any observed price time series by shifting around said curves. In other words, this is non-falsifiable, which is a complaint about economic theory that you will often see me write. Fair value ("rational expectations"). The value of an asset is determined by the discounted value of future cash flows it generates. In the interest rate world, this is the "rate expectations" view. Arbitrage. This can be viewed as a variant of "fair value." However, it could be applied to things that do not generate cash flows; in this case, we can generate a fair price for something relative to something else. For example, we would price natural gas relative to coal based on energy equivalence relationships. For financial assets within a given currency, fair value analysis provides a reasonable framework for pricing. We are effectively pricing assets versus holding domestic cash. Unfortunately, this does not work for currencies (outside of currency peg regimes); the expected value of a U.S. dollar deposit to a Canadian depends almost entirely on the future exchange rate. This means that we can determine exactly the forward value of a currency versus spot, but we have no insight about what determines the spot value. (The relationship between forward and spot pricing of currencies is known as covered currency parity; I have a primer here.) This means that we cannot use the third framework in the list above. If all goods could be traded across borders, we could possibly use arbitrage relationships to determine currency fair value (framework #4 in the list above). This is what "purchasing power parity" theories revolve around; the best-known example is the Economist's Big Mac Index. However, anyone familiar with purchasing power analysis will be aware that a currency can swing +/-40% around the predicted "fair value," and so this method of analysis is fairly weak. From the perspective of theory, the problem is that relative prices in different countries are not the same, so there is no unique level of the currency that makes prices completely comparable. This leaves us with "supply and demand." Within the currency market, we can observe two sectors generating supply and demand. The real economy -- how are exports and imports balanced? Capital flows. These flows can be broken down into direct investment (including takeovers), fixed income and equity flows. In my view, far too much importance is placed upon the trade and fixed income parts of the flows. For the developed markets, flows in risk assets are far more important for the determination of currency levels. How Does The Policy Rate Fit In? The usual rule-of-thumb is that a higher policy rate will tend to increase the value of a currency, all else equal. This makes sense in a currency peg regime; higher domestic interest rates makes it more attractive to bet on a peg not changing. It is less clear as to why this would be true for a floating currency. In my view, it is defensible if we take a realistic view about central bank reaction functions. In modern DSGE macroeconomic models, activity is driven by a dominant forward-looking central bank.The reductio ad absurdum of this viewpoint is the belief that the central bank can set the level of nominal GDP solely by announcing a target for it. A more plausible description of the situation is that the central bank attempts to forecast activity, and sets the policy rate based upon the forecast. Although the central bank may have only a questionable ability to forecast what is going to happen in 1-2 years, it has enough resources to have a better idea about current activity than is the case for any particular market participant. Therefore, bond market analysts spend their time fighting over what is going to happen in the next few years, while the central bank acts as a referee to give the "best" estimate of the current state of the economy. Therefore, a central bank that is confident enough to raise rates provides a generally good quality signal that the prospects for an economy are tilted towards faster nominal growth. In an environment with unhinged inflation expectations (such as in the 1970s), that might not be a good thing for financial assets. However, in the post-1990s environment with stable inflation rates, higher nominal activity is correlated with faster real growth as well. This growth attracts investors in risky assets (including corporate mergers and acquisition activity, which can generate substantial cross-border financial flows). The chart below gives an example of how complicated this can be. 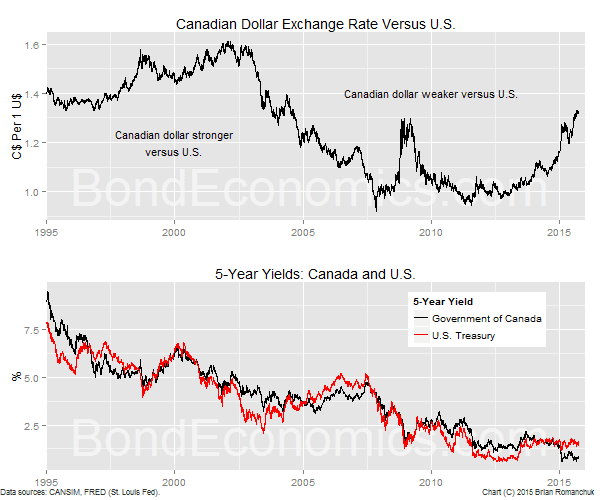 The top panel shows the Canadian dollar versus the U.S. dollar; the quote convention is that a higher value is a weaker Canadian dollar. The bottom panel shows the 5-year government bond yields. (We need to look at both sets of interest rates, as a currency price is a relative price, and what matters is the spread of interest rates.) We can see very considerable swings in the currency; one could attempt to line them up with what is happening with relative interest rates, but it is difficult to do. If we just look at the end of the data set, we see that it is conforming to the rule-of-thumb I gave above. Although the U.S. policy rate is still below that of Canada, the weakness in the Canadian economy has led the 5-year Government of Canada yield to drop below that of the 5-year Treasury. The Bank of Canada is unlikely to hike rates, while the Fed is expected to slowly "normalise rates" (whatever that means). At the same time, the Canadian dollar has weakened. The interest rate signal is pointing in the same direction as the signal from the real economy, and the relative attractiveness of Canadian corporate assets. (The value of the Canadian equity market was largely dominated by commodity firms, and so commodity weakness provides an incentive for outflows out of Canadian stocks.) This is also aligned with trade trends, as the value of Canadian energy exports has collapsed. This example shows that we cannot easily disentangle the real economy effects from the financial market effects. Once again, policy rate trends may tend to lead this process, but that can be attributed to central banks accurately gauging current conditions. This means that statistical tests could signal that policy rate spreads "cause" currency moves. Although true, this usage of the word "cause" should not be mistaken for the common sense interpretation of the word, which would imply a cause-and-effect mechanism. In my view, the capital flows are the driving mechanism, and policy rate spreads tend to be correlated with those flows. You need to rely on "supply and demand" to value a currency, which offers very little insight when compared to the ability to assert that the fair value of a government bond is the expected average of short rates until the bond's maturity. My opinion is that developed floating currency values are largely determined by equity flows (including cross-border acquisitions). Those equity flows are typically correlated with other factors, and so it is difficult to disentangle the driving forces using statistical analysis. For example, if we just want to look at the effect of interest rates on the currency, the usual reaction of central banks mean that they will be relatively hawkish when the local economy is relatively strong. This relative strength will also act to attract equity flows. I hope to expand upon these points in later articles. It'd be interesting to know how much of the capital flow comes from monetary creation - aka loans. Borrowing in CAD to buy USD assets ought to alter the FX supply/demand balance and push the CAD down (a classic carry). The open question for me is how does the market settle in aggregate, how much does bank lending play a part in that, and what would happen if you restricted lending by policy (say making loans for currency sales/purchase of foreign assets unenforceable). If that is enforceable then purchase of foreign assets would require either equity or foreign sourced loans. In the emerging markets, where they have a fixed exchange rate mentality, I believe there is a fair amount of foreign currency borrowing. When your idiot central bank is running around wailing about "currency wars," that was a signal to borrow in USD to buy local currency assets. And now they are paying the price for that (and once again wailing about Fed policy). My experience is with Canada, and firms here do not create large currency exposures. Many operate partially in USD terms, and will borrow in USD to act as a hedge against that. Since the USD borrowing is staying in the effective "USD area", there is no net demand applied to the forex market. Everybody is well aware that the currency can run quickly in either direction. The net exposures from the "real economy" are dwarfed by equity flows. It is possible that other developed countries may have business sectors that are more willing to run cross-currency borrowing, but I have seen limited evidence of that. There would be a lot more blow ups when there is a run in a currency, and I do not recall any recent episodes where that has happened. This is similar to my model for equities trading where the supply is psychologically determined by a population of owners willing to sell versus owners willing to hold at a posted price and the demand is determined by a population of buyers willing to buy at the posted price. The owners in FX are domestic depositors in respective countries and the market makers are domestic banks or non-bank FX firms owning deposits in domestic banks. There should be a swap of the name on the deposit account in an FX deal. When I think of psychological shortage or surplus conditions in two-sided markets I think of large populations of holes and electrons in semiconductors when I learned semiconductor theory. Semiconductors have avalanche effects which I think happens in two sided markets although the mechanisms are not as predictable as in a device where conditions can be controlled by experiment. The concept behind this paper is that avalanche effects in physical systems (magnetic materials) resemble the clustering of transactions in financial markets. Also even if all agents have new information at the same time they are reacting with hold, sell, and buy decisions based on diverse strategies. I have developed intuitive models by observing thousands of price-volume stock charts which show large volume trading arriving in clusters on multiple time periods. There should be periods where the outlook of short term traders and long term investors converge toward greed, volume should be high and prices would rise as owners hold for higher prices and buyers take a position at rising prices. Eventually owners and buyers should converge toward fear as the price overshoots any reasonable valuation and everyone realizes the price is being driven by market action of so-called momentum. Even though action may be driven by momentum or collective market action one should not sell until there is high volume with little price advance (churning) which means some profits are being taken and the new owners are very likely to be taking a paper loss during a correction. One should sell in the climax volume to take profits before the weak new owners and buyers reverse to uniform perceptions of fear with prices averaging down. Overshoot and collapse patterns on some time frame are the way stocks actually trade and this is due to multi-agent perceptions converging, diverging, and converging over different strategies and time frames. The FX market would have certain fundamental pressures which are less persistently biased toward long positions than in a domestic equity market unless a small currency is being temporarily squeezed by large external speculators. Also I sometimes wonder if central bank currency swaps take price pressure off of currencies that would otherwise manifest in the absence of central bank cooperation?